A few years back I was out looking for a fruit tree that would actually thrive out here in the Mojave Desert. I have tried Cherry, Apricot, Pear and Apple with some limited success, but they just never did well. You would think that Apple trees would be easy to grow in Apple Valley, but I have never had any luck yet! I found a pomegranate tree in a local nursery and figured that I’d give that a chance. I planted the tree right up against the chicken house (that really needs to be painted btw…) The first year, my tree grew fast and had a few reddish -orange flowers (no fruit) In the fall, I trimmed the tree so that it would grow as a tree more than a shrub. It’s been 3 or 4 years now and the tree is now 8′ tall and maybe 4′ wide. I’m sure it would be taller, but every year now the branches get weighed down with fruit – sometimes enough that the fruit is resting on the ground! I would have to say that i have found a fruit tree that will thrive in the Mojave Desert! Back in the late ’60s, my grandmother used to make this jelly for us. 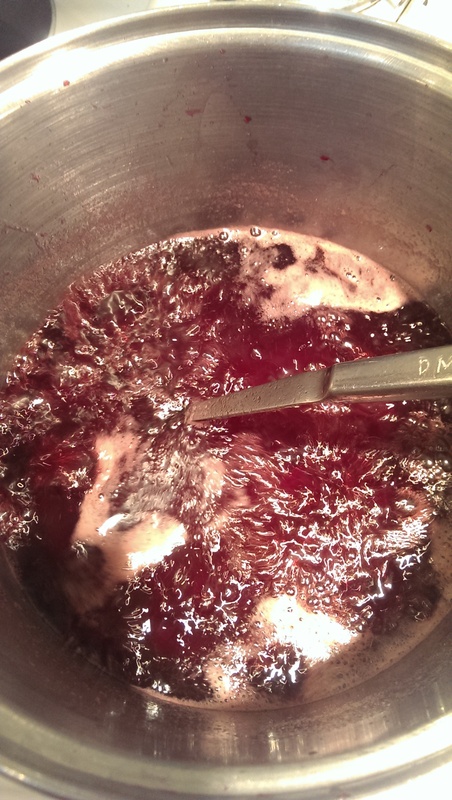 It is one of my favorites – it’s ruby red, tart, yet sweet and is great on homemade bread! This is her recipe, except I use liquid pectin as opposed to dry. 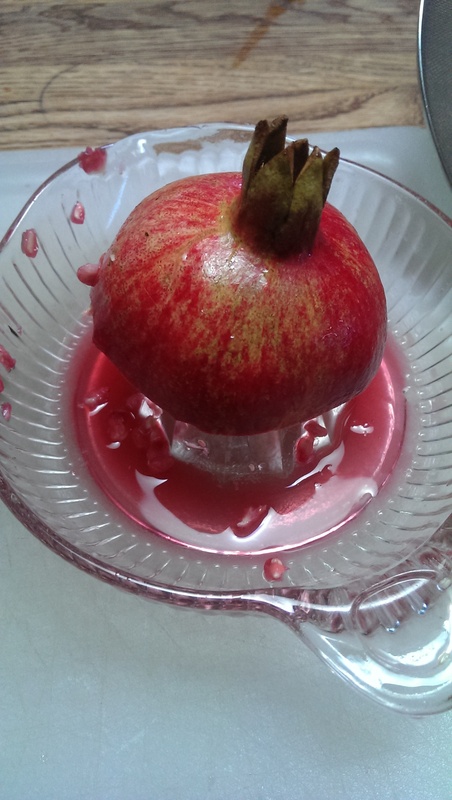 It seems that there are many ways to juice a pomegranate and I have tried a few of them, but what works for me is to cut the pomegranate in half and juice it on a citrus reamer until all the arils (the dark red, juicy “pouch” that covers the seed) are crushed or released. Then pour into a mesh strainer and crush the remaining arils. Other options would be using a juicer, food processor or this method from Old World Garden Farms which uses a Ziplock bag and a rolling pin. Thank you Donna (Sharing Life’s Abundance) for the Link! 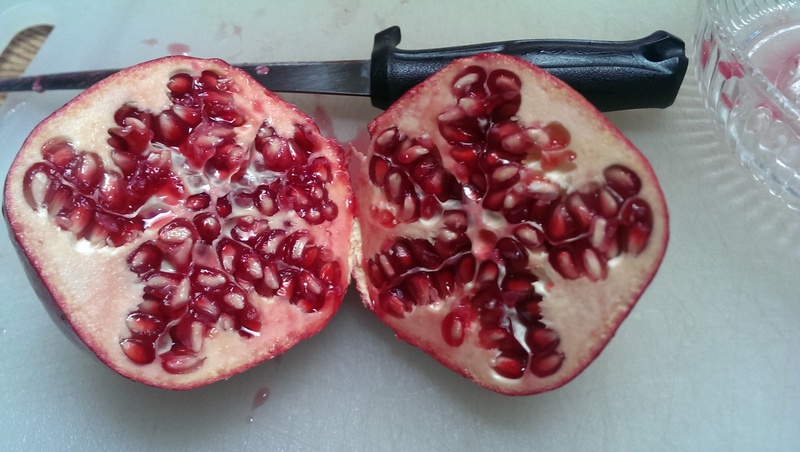 Pom Wonderful, but I prefer doing it myself! Add the 5 cups of juice and the 6 cups of sugar to an appropriate sized pot, with enough head space that the jelly won’t boil over. Bring to a full boil for 10 minutes. Add lemon juice and return to a full boil. 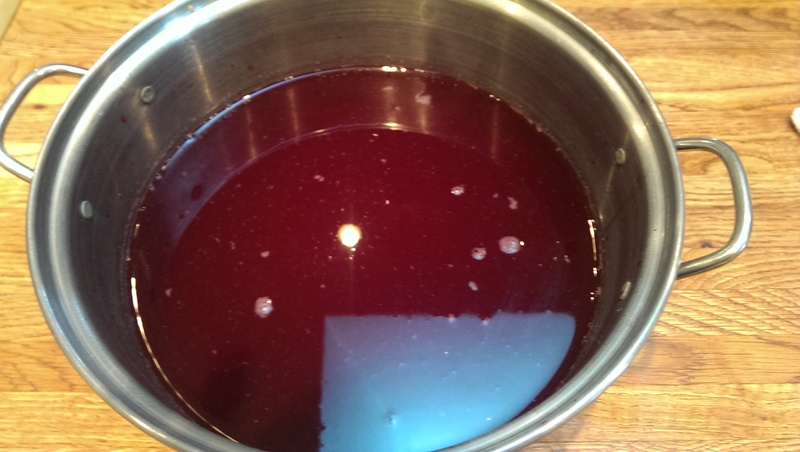 Stir in pectin and return to full boil and boil 1 minute. Use a cold spoon or a plate to check that the jelly will set. A note on doubling the recipe:Last year I thought I’d be clever and just double everything in the recipe to save myself some time. 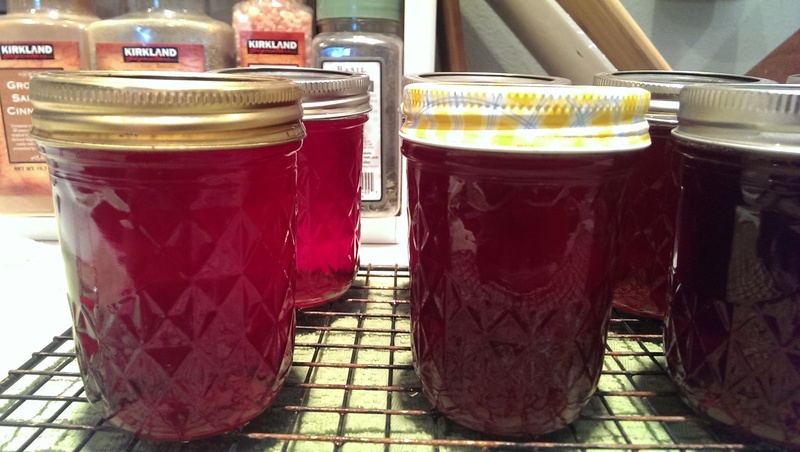 It seemed like a great idea… I did everything the same as I would have if I did a single batch – but the jelly didn’t set! Now what do I do? I had 17 jars of pomegranate syrup! (Very tasty though…) I let it all sit until the next day (just in case it was just slow in setting) then I opened 8 jars and dumped them back into the pot and started over. I added 2 tablespoons of lemon juice at the boil and then more pectin. This time it worked and in the end I ended up with 8 jars of jelly and 9 jars of grenadine syrup. Although the syrup was good, I will never double a jelly recipe again! 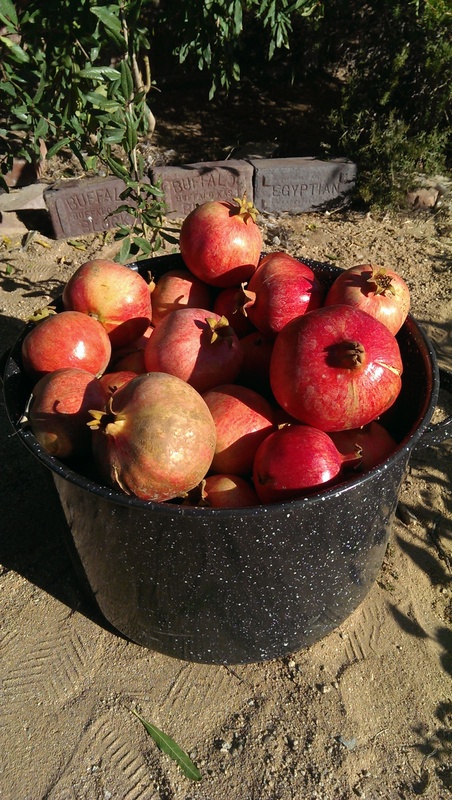 This entry was posted in DIY, Gardening, Jelly and tagged Apple Valley, backyard, Certo pectin, DIY, food, fruit, gardening, grenadine, Homemade, jelly, Mojave Desert, pectin, Pomegranate, pomegranate juice, Recipe, syrup, trees. Bookmark the permalink. Your jelly is beautiful Dan. I too have learned the hard way about doubling batches. 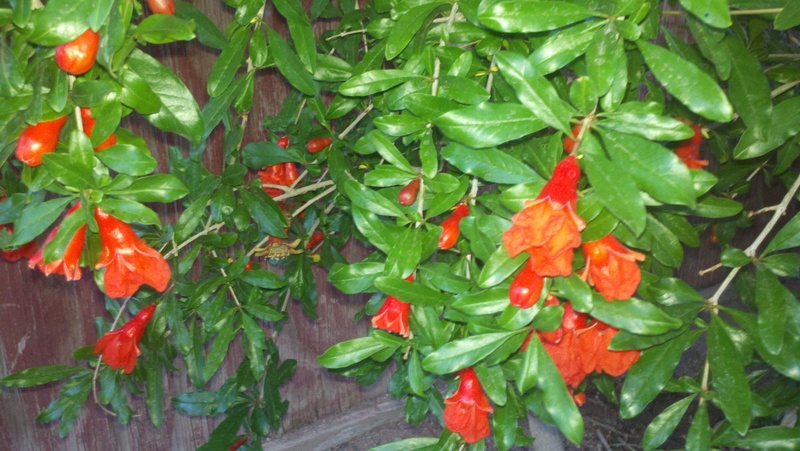 I have seen people here in the Sonoran Desert make hedges with the pomegrate bushes. I may be experimenting with that myself.